Greencross Safety Fire & Equipment Consultants Pte Ltd - A safety consultant group in the market for more than 30 years, we are dedicated to provide Workplace Safety & Health, Environment and Quality Services to industries. Purpose: The Workplace Safety & Health Act came into operation on 1st September 2006. It was extended to cover all workplaces on 1st September 2011. In accordance with the Workplace Safety & Health (Risk Management) Regulations, the employer, self employed person and principle shall conduct a safety & health risk assessment. Such safety & health risks shall then make known to the person who is working for or on behalf of the employer, self-employed person and principal. 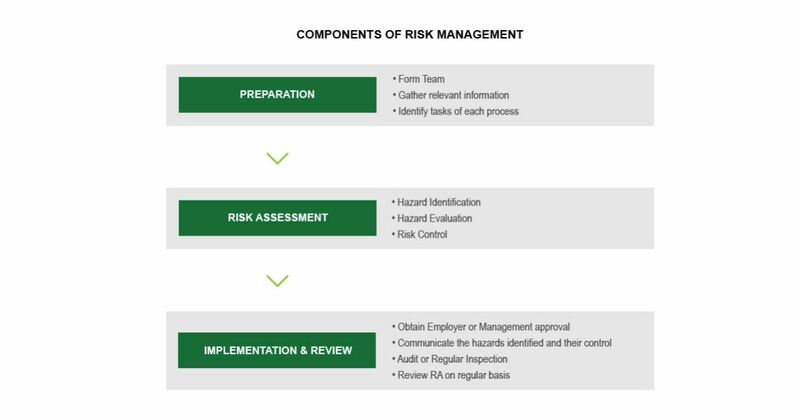 Scope and Application: The Risk Management procedure shall be applicable for all work activities under the purview of the workplace. It is applicable to all workplaces. RA shall be carried out and risk control measures shall be implemented before any new work comences. As per Regulation 9 of WORKPLACE SAFETY AND HEALTH (SAFETY AND HEALTH MANAGEMENT SYSTEM AND AUDITING) REGULATIONS 2009, it shall be the duty of the occupier of construction worksite to appoint a workplace safety and health auditor to audit the safety and health management system of the workplace at a frequency as specified below. The audit methodology includes document review, site inspection and interview of key personnel. The man days required for audits will vary according to audit criteria adopted for different types of workplaces. The audit will be conducted by MOM Approved WSH Auditors employed by MOM Approved WSH Auditing Organization. ConSASS provides a profile of the development status and maturity level of each component of a worksite's safety and health management system. This helps management to better allocate resources in order to elevate standard and improve the effectiveness in managing a worksite's safety and health risks. As an assessment tool, ConSASS can be used for cross-comparison between worksites in relation to their effectiveness in managing workplace safety and health risks. Unified assessment method in term of standardisation of audit checklist and adoption of a common audit scoring system. This would enhance the consistency in the auditing process and allow cross comparison of worksites in terms of the capabilities in managing safety and health risk. Mechanism to profile the maturity level for each element of the SHMS in a worksite. With availability of the maturity profile, the management of the worksite could systematically focus its attention to improve the weaker elements in order to elevate the overall maturity of their SHMS to manage safety and health risk. As applicable, identification of areas for potential improvement of the WSH Management System. Audit Scope covers all the work activities at the above project based on current scope of activity at site. Familiarization Tour of Project Site. Conduct opening meeting covering all relevant items as per auditing standard. Review the results of previous audits, if any. Ensure that audits are carried out according to requirements stipulated by Regulatory Authorities. Assign the tasks to audit team. Keep the client informed of audit progress. Where the available audit evidence indicates that the audit objectives are unattainable or suggests the presence of an immediate and significant risk (e.g. Safety), the audit team leader shall report this to the client. Review with the client any need for changes to the audit scope that becomes apparent as on-site auditing activities progress. Attempt to resolve any diverging opinions between the audit team and the client concerning audit evidence or findings, and record unresolved points. Review audit findings with his team. Conduct closing meeting covering all relevant items as per auditing standard. Present audit conclusions during closing meeting. Consolidate the audit report and send to WSH Auditing Department Head of WSH Auditing Organization (Greensafe International Pte Ltd). Conduct audits according to requirements from Regulatory Authorities. Carry out audits as per audit itinerary. Discuss audit findings with lead auditor prior to closing meeting. Follow the directions given by lead auditor. Assist the lead auditor in presenting findings on clauses / elements audited by him during closing meeting. Prepare and submit to lead auditor with report on clauses / elements audited by him. Providing clarification or information as requested by an auditor. Technical Experts will be deployed as necessary for audits. A testimony will be issued to the audited organization stating the company name, location, audit criteria, audit date and auditing organization name. If audited client has any request for information and complaints, he can email to greencrosssafety@gmail.com stating clearly client name, identity & contact details of person making the request and details of complaints. Additional information requested may be approval at the discretion of. For complaint received, Learners Hub will evaluate the complaint and take necessary action(s) to address the complaint. Learners Hub will feedback to the complainant on the action(s) taken. Greencross Safety Fire & Equipment Consultants Pte Ltd understands the importance of and is committed to impartiality in providing the Services an shall not allow commercial, financial and other pressures to compromise impartiality. Greencross Safety Fire & Equipment Consultants Pte Ltd manages any conflict of interest to ensure objectivity of its audit. View our full policy here.